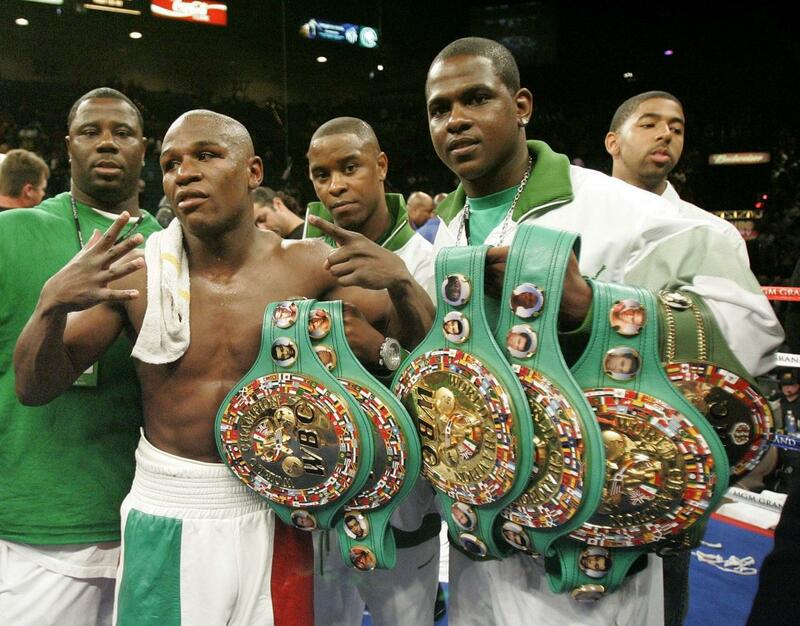 Floyd Mayweather Jr. is known worldwide as the pound for pound king of boxing. He is also the highest paid athlete in history. Winning 12 world titles across 4 different weight divisions (defeating 21 title holders along the way) he retired undefeated in 49 professional fights. Almost half of his entire life was spent as a world champion (18 years). He has made other world champions look ordinary. 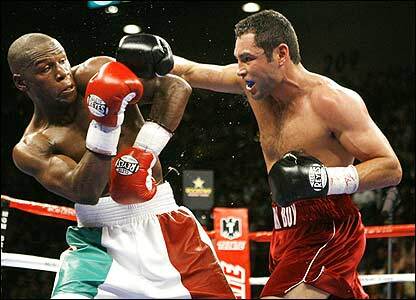 In 49 opponents only Oscar De La Hoya, Jose Castillo and Jesus Chavez even came close to beating him. For a fighter to wipe out his opposition with such ease is unprecedented. This article provides an objective analysis of Mayweather’s skills by comparing him with the greatest fighters of today and the past. 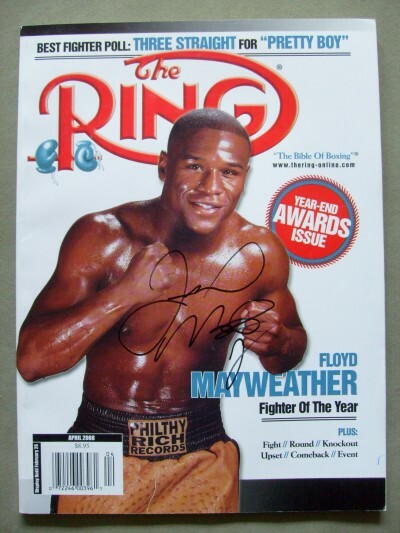 Mayweather Jr. is the most complete fighter in history. Excellent offence, defence, the ability to adapt, footwork, balance, he’s got it all. Previous great champions often lacked in certain areas. In the words of Mike Tyson: “fighters are getting better, even though we don’t like to admit it, they’re better”. Most boxing fans think Floyd was a “defensive” boxer. But that’s because they’ve only been following him in the later part of his career. Look at the majority of his professional career and you’ll find him using machine-gun combinations to hurt opponents. He remained undefeated largely because opponents couldn’t handle his offence. 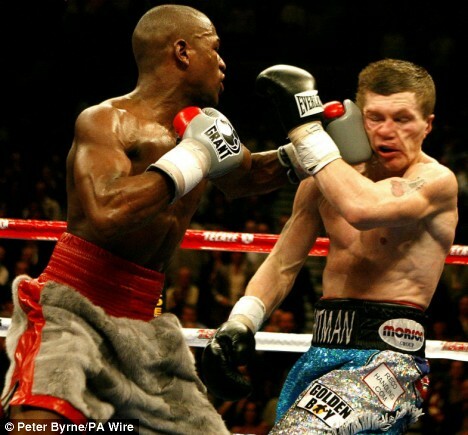 They say it is the most important punch in boxing and Floyd’s is amongst the greatest. Watch his bout against Augie Sanchez in the US Olympic Trials on YouTube for a text book perfect demonstration. 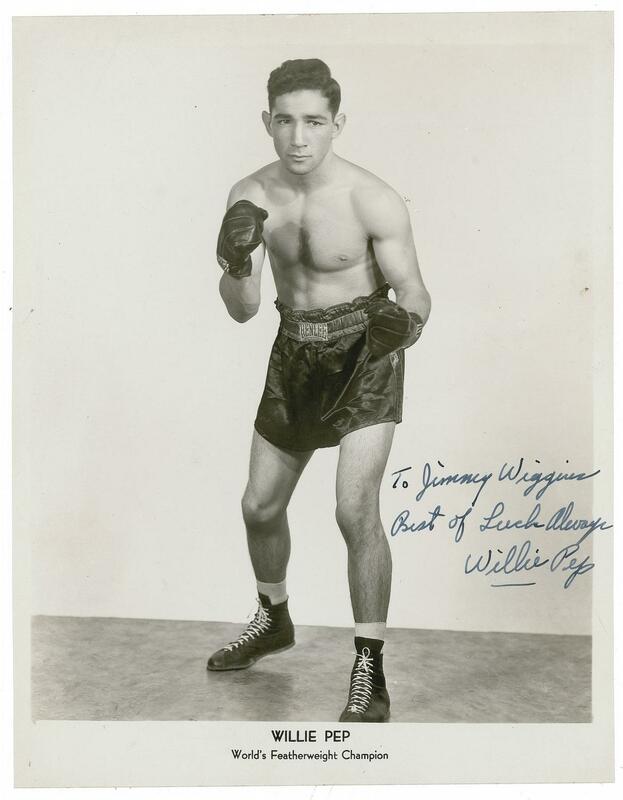 He further developed his jab throughout his professional career, even knocking an opponent down with a jab to the body. One thing Floyd is able to do so well that most fighters aren’t is to take a lightning step forward with the jab, then step back out with expert timing. Not only does this increase the power of his jab, but it means he usually won’t get hit after throwing it. His jab is diverse, used as both a powerful weapon or a set up tool. The greatest jabs in history mostly belong to the heavyweights. Smaller men usually don’t have a tremendous jab. This makes it all the more remarkable that Floyd can intimidate opponents with his jab. In 2013 Floyd left the bigger, stronger undefeated Saul “Canelo” Alvarez completely confused and dismantled with the use of his jab. Most fighters need to set it up with a jab first. Floyd can lead with his right. Using perfect timing and great speed, he has shown time and time again the ability to hit an opponent, then slip under what ever punch is coming back. HBO’s highlight of his fight with Marquez shows this happening in slow motion. Poetry in motion is the best way to describe it. It looks almost too perfect, like its been choreographed. There have been other fighters who have done this but none do it as smoothly as Floyd. He moves his head just enough to make you miss by an inch, conserving maximum energy in the process. 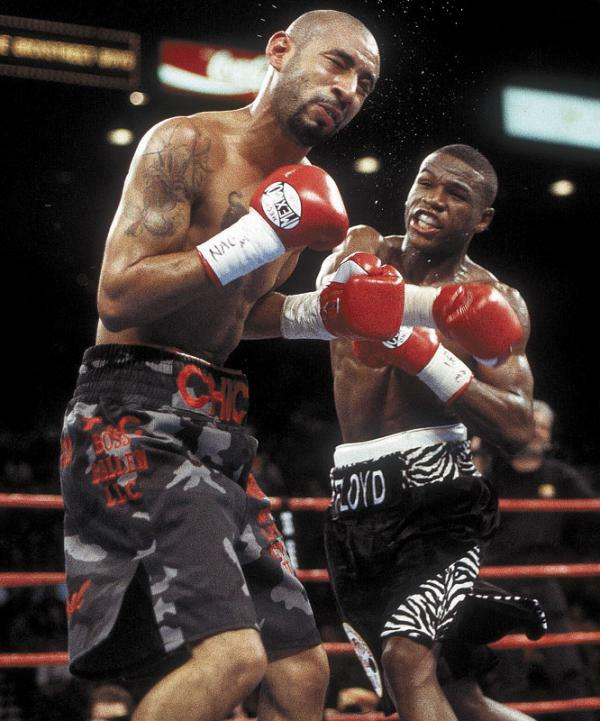 Lets compare Floyd to other sensational hitters like Prince Naz and Roy Jones Jr.
At their best, these were guys who would destroy anybody stood in front of them. But Prince Naz got dismantled by Barrerra. Roy Jones got outboxed and knocked out 5 times once his speed deteriorated. What that showed us was that Naz and Jones were dependant on their talent more than they were on their skill. Floyd has been able to utilise his actual skills when he has been matched for talent/speed. 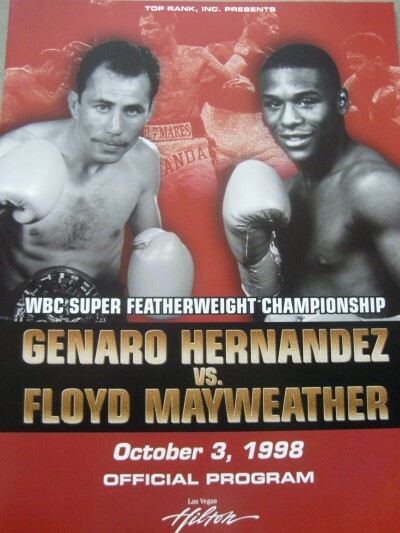 Watch his fights against Jose Luis Castillo, Jesus Chavez, Zab Judah and De La Hoya for examples. Floyd’s ability to adapt to any opponent is his most remarkable asset, and separates him from other champions. Never has there been a fighter who could fire with speed and water-like fluidity, simultaneously maintaining perfect balance. There is no strain in his combinations; almost like he was born to box. George Foreman labelled him “the most natural fighter” he had ever seen. 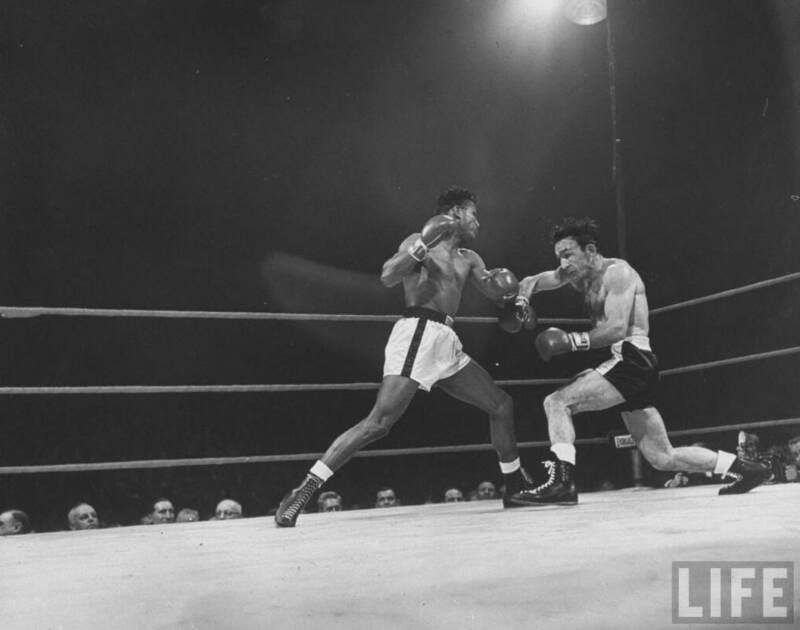 Sugar Ray Robinson had tremendous combination punching ability. But he often left his chin high and his guard wide. Floyd can keep hitting, while being defensively responsible at the same time. Watch round 8 of the Chavez fight for one of the greatest offensive rallies of his entire career. Back and forth toe to toe action. Sugar Ray Robinson (left) is widely believed to be history’s greatest fighter. The term “pound for pound” was invented for him. Sugar fought from 1940 – 1965. He retired with 173 wins, 19 loses, 6 draws and 2 no contest matches. 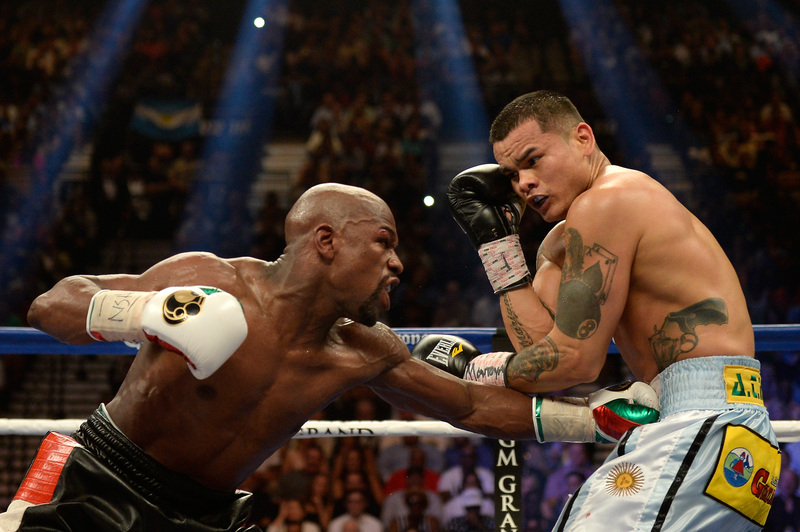 A key asset in boxing and Floyd has an abundance of it. He has crafted masterful ways to trick opponents and set up shots. Baiting, parrying, feinting, holding, manoeuvring with his forearm, he uses every trick in the book. Most fighters go into the ring with only one or two game plans but Floyd simply makes any number of adjustments during the fight. Floyd has the most developed arsenal of ring craft ever seen. Speed is no good if you are missing the target. Amir Khan’s hand speed is greater than that of Floyd, but in missing more punches he is open for counters and less effective. Statistics by compu box show that Floyd’s accuracy (determined by punches connected vs missed ratio) blows away not only today’s greats, but also many of history’s finest. Floyd’s punch connect rate is double that of Andre Ward. The only fighters in history that bettered Floyd’s accuracy stats are Joe Louis and Lennox Lewis. 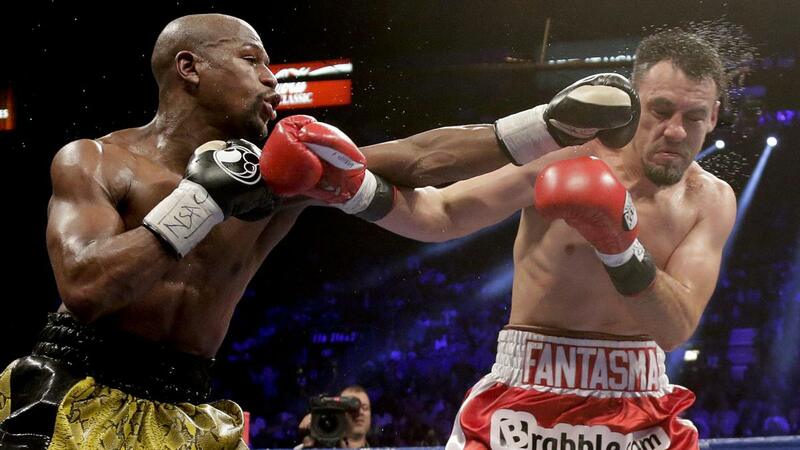 Watch how Floyd he picked off Marquez for a masterclass on well-timed shots. Marquez himself is known for being an elite counter puncher. Muhammad Ali and Sugar Ray Robinson are universally known as the greatest fighters of all time. It is largely because of their accomplishments and personality. Looking at offensive skill alone, I believe Floyd Mayweather is better than both. His footwork is better than Ali’s because it is more economical. Ali would “dance” moving more than he needed to, and often tire towards the final rounds. Floyd cleverly takes smaller steps and saves the energy. Robinson’s punches were arguably as quick and powerful as Floyd’s. But Robinson’s balance wasn’t as good, his punches were thrown widely, and he employed less ring craft. 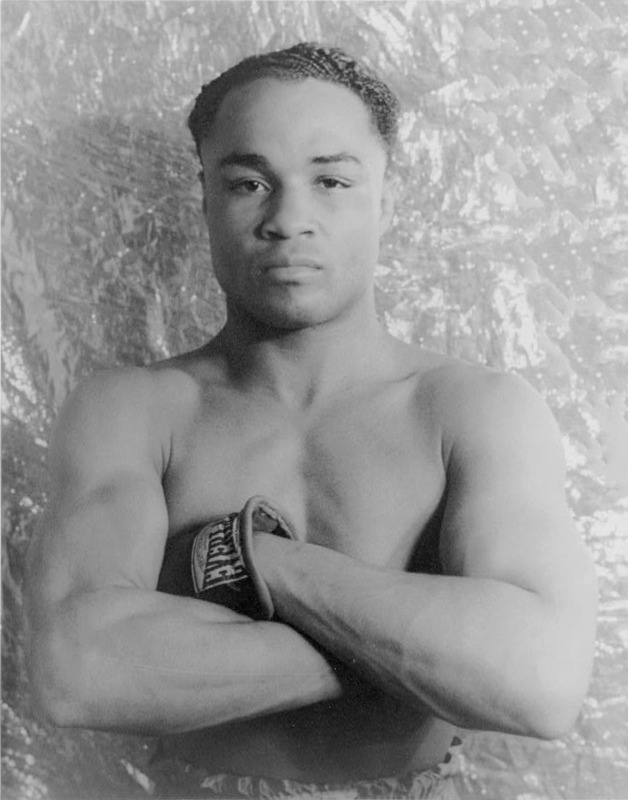 Henry Armstrong fought from 1931 – 1945. In his time there were only 8 different weight divisions (compared to 17 today) and yet he simultaneously held world titles in 3 of those divisions. Joe Frazier admired him for throwing up to “300 punches a round”. “Homicide Hank” retired with 150 wins, 21 losses and 10 draws. 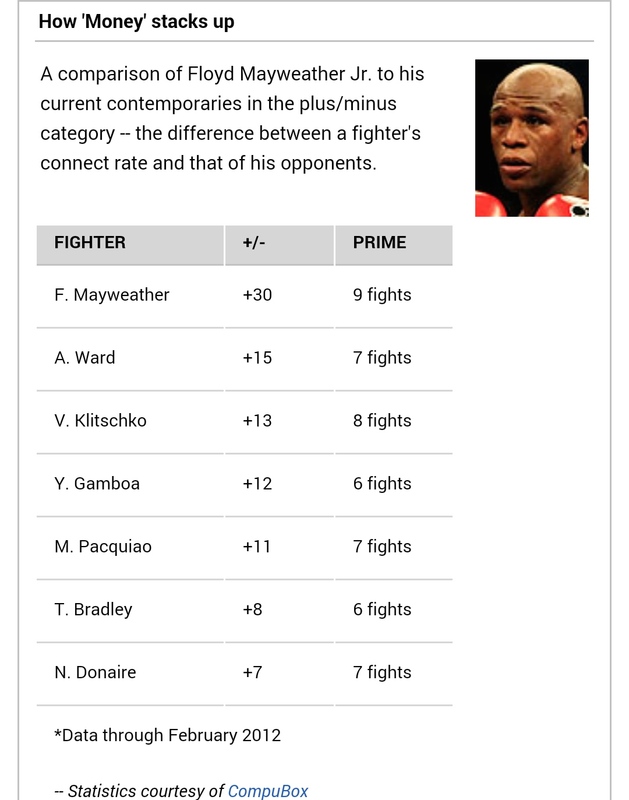 Some would argue that fighters like Henry Armstrong and Manny Pacquiao are better offensively than Floyd. Maybe Ali’s jab was better, or Sugar Ray Leonard had a better right uppercut. These fighters were better at crowd pleasing, which is not a valid factor when making an assessment of skill. It is the more intelligently used weaponry in Floyd’s arsenal, combined with perfect balance and fluidity that makes his offensive skills supreme. Bob Arum is one of history’s biggest boxing promoters, having worked with greats like Muhammad Ali, Marvin Hagler, Sugar Ray Leonard and Evander Holyfield. “We believe in our heart of hearts that Floyd Mayweather is the successor in a line that starts with Ray Robinson, goes to Muhammad Ali, then Sugar Ray Leonard…We believe that he epitomizes that style of fighting”.